Ryan Winder was sent off on his return to Lancaster City on Saturday. Former Dolly Blue Ryan Winder was sent off as Lancaster City drew 1-1 with Droylsden in the FA Trophy. Lancaster started well and deservedly found themselves in front after just three minutes when Jacob Gregory latched onto an inch-perfect pass from midfield to slot past the ‘keeper with ease. And it wasn’t long before things were made worse for Droylsden as ex-Blue Winder was sent off for a late challenge on Simon Wills. However, the sides were back on level terms on the half-hour mark when Josh Heaton headed home unmarked from five yards out. The rest of the game was low on chances with the sides now set to battle it out in a replay at the Butchers Arms on Tuesday night. Phil Brown’s City started the game on the front foot and were almost ahead after 30 seconds when Gregory turned quickly in the box and fired a shot at James Coates who saved well to his left. And the Dolly Blues were rewarded for their good start when Gregory found himself in acres of space on the right-hand side, latched onto a brilliant ball from midfield, out-ran the defenders and slotted home past the ‘keeper from 12 yards. This was as good as it got for the home side though as they allowed Droylsden too much time on the ball and sat back, inviting pressure. And Droylsden should have been level as Heaton was found unmarked in the box twice, his first header was put wide before his second was saved expertly down low by Mike Hale. 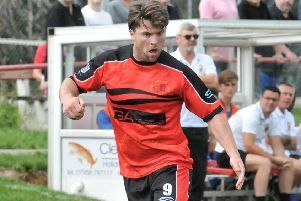 The visitors were unable to capitalise on their good play and looked to be really up against it on 20 minutes when Winder saw red, much to the delight of the Giant Axe crowd, the midfielder having left the club for pastures new in the summer. Droylsden continued to push for an equaliser however and it was Hale who came to the rescue once again as Liam Caddick’s well-struck shot was tipped onto the crossbar and out for a corner. The leveller came soon after though as Heaton was again unmarked and headed home with ease from inside the six-yard area leaving Hale with no chance. It was a disappointing goal for Lancaster to concede and it didn’t get any better in the second half as they struggled to break down Droylsden’s 10 men. Neither side started the second half with much intensity and the hosts looked a completely different side from the one that bravely went out of the FA Cup seven days earlier. It took half an hour for the first decent chance of the second half and it went to Droylsden as Billy Hasler-Cregg blasted over the bar from 20 yards after some tricky play just outside the box. Lancaster desperately tried to push for a goal late on as Jacob Davis’ shot went just wide of the post before Louis Mayers tried his luck from range but it wasn’t to be. Lancaster City: Hale, Henry (Hudson), Clark, Wills (McKenna), Davis, Mercer, Gregory, Akrigg, Mayers, Russell, Crolla (Waters). Subs not used: Raybould. Droylsden: Coates, Antoine-Clarke (Samuels), Clancy, Rouse, Heaton, Hampson, Caddick (McDonagh), Winder, Farrell, Lewis (Clarke), Hasler-Cregg. Subs not used: Rudge, Cesaire.